Q1 : Note what are the marriage rules that are followed in your society? Compare your observations with these made by other students in the class. Discuss. · Every society comprises several types and rules of marriage. Our society particularly follows monogamy. Monogamy is a system of marriage wherein one man can marry only one woman, and one woman can only marry one man. People are only allowed to re-marry after the death of their spouse or after a divorce. Thus, they cannot have more than one spouse at the same time. · Generally, the marriages are fixed by the parents and this is known as arrange marriage. Parents choose the relevant partners for their sons and daughters. However, some people also prefer love marriages and their partners are self chosen. · Some societies also practice the rules of polygamy and polygyny, wherein the men and women can have multiple partners as their wives and husbands respectively. However, this practice is not allowed in laws of marriage of some religions. Q2 : Find out how membership, residence pattern and even the mode of interaction changes in the family with broader economic, political and cultural changes, for instance migration. · With the change in culture, the membership, residence pattern and mode of interaction within a family also changes. For example, in a matrilineal society the women play a major role in decision-making in the family. However, in a patriarchal society, men exercise authority and dominance over the family. · Another example of cultural change is the preference or resistance towards individualism. If the members of a family are individualistic, then there are chances of having a nuclear family. On the other hand, increase in the inter-personal relationships leads to a joint family. · During post-unification period in the 1990s, Germany witnessed a rapid decline in the number of marriages because the new German state withdrew all the protection and welfare schemes which were provided to the families prior to the unification. This is an example of broader political change influencing the family. · When a society undergoes economic changes, even the family gets affected indirectly. For example, industrialisation has led to the emergence of nuclear families and women have also adopted instrumental roles in the family. · Due to economic instability in a society, people migrate in search of work. For example, people from a flood affected village migrate to cities in search of new homes and new jobs. In some cases, women stay at their village and perform household activities, while the husbands migrate to the city for work. · Migration also leads to a change in the housing pattern because the people who migrate from villages have to live in slums and in tents. Similarly, in village they live with their parents and other relatives but in the city they either have to stay alone or with their husband or wife and children only. This change depicts a change in the membership pattern of the family. Q3 : Write an essay on `work'. Focus on both the range of occupations, which exist and how they change. · Work means carrying out activities that require expenditure of mental and physical effort and can be paid or unpaid. It has the objective of production of goods and services that cater to human needs. Mainly, paid work is considered as real work and paid workers are referred to as being employed. · There are two types of occupations, namely informal and formal. · The informal employment is found in the unorganised sector of the society, whereas the formal employment is found in the organised sector of the society. · Informal employment is mostly unrecorded and the workers are not paid on a regular basis. Also, the payment is made either in terms of money or as goods or services. · Informal employment mostly includes physical work, whereas in the formal employment both physical and mental work is involved. Also, workers are paid a regular salary in terms of money. · Before industrialisation, in traditional societies, the work was performed in house itself. This formed the informal employment. However, after industrialisation, with the advancement of technology, work shifted from home to factories and offices, forming the formal sector of employment. · These occupations change gradually. For instance, as the variety of work expanded and became complicated, it led to a specialised division of labour. Human labour was replaced by machines and Industrialisation broke down processes into simple operations that could be precisely timed, organised and monitored. Q4 : Discuss the kind of rights that exist in your society. How do they affect your life? · Political rights such as participation in the formation of the government by casting vote. · Civil rights, such as freedom of speech, choice of religion, the right to equal justice before the law. The citizen has the freedom to live anywhere in the state territory and has the right to own property irrespective of his/her gender. · Social rights, such as health benefits, unemployment allowance, and setting of minimum level of wages. The citizen can enjoy a minimum standard of economic welfare and security. · These rights help in the smooth functioning of life of individuals, as they help in the growth of personality. For instance, the individual can go for higher studies of his/ her subject of interest, he/she can learn any form of music and dance, and can also practice any religion. Therefore, the individual has right to make his/her own choice and can also demand justice by appealing to the court. Q5 : How does sociology study religion? · An empirical study on the various functions of religion and its interrelatedness to the society. · It uses a comparative method. · It investigates the religious beliefs and practices in relation to other aspects of the society. · There are different groups of religion that originated with the change and need of the society such as Hinduism, Christianity, Islam, Buddhism and Jainism, etc. · Religion has certain beliefs, norms, rules and regulations that are expected to be followed by its members, which govern and regulate their behaviour. · Further, religion has had a very close relationship with power and politics. There have been many social movements which were carried out on the basis of religion. · Classical sociologists believed that as societies have modernised, the influence of religion on the lives of individuals has decreased, which has led to secularism. · Many thinkers of sociology have presented their theories upon religion and their origin. For example, Max Weber in his study, The Protestant Ethic and The Rise of Capitalism viewed that capitalism was a result of Calvinism and their thinking of increasing the economic activity, in order to please the god. · Similarly, Emile Durkhiem presented the view of differentiating the sacred from the profane that existed in religious societies. · Further religion is not only a private matter of individual but it also has a public character, as it holds strong ties with other institutions like politics, economics, education and marriage and kinship. Q6 : Write an essay on school as a social institution. Draw from both your reading as well as your personal observations. · The need for education gave rise to schools, and sociology terms this need as a process of transmission or communication of group heritage, which is common to all the societies. · The schools function in order to discipline and regulate human behaviour. Hence, acting as a permanent and binding character. · Furthermore, Ginsberg defines the established institutions as "the recognized and established usage governing the relations between individuals and groups", and schools are established institutions that provide formal education to students. · They have their own norms and values and certain rules and regulations that are to be followed. · According to Durkheim, for its survival, a society needs a common base - a certain number of ideas, sentiments and practices which education must inculcate in all children indiscriminately. 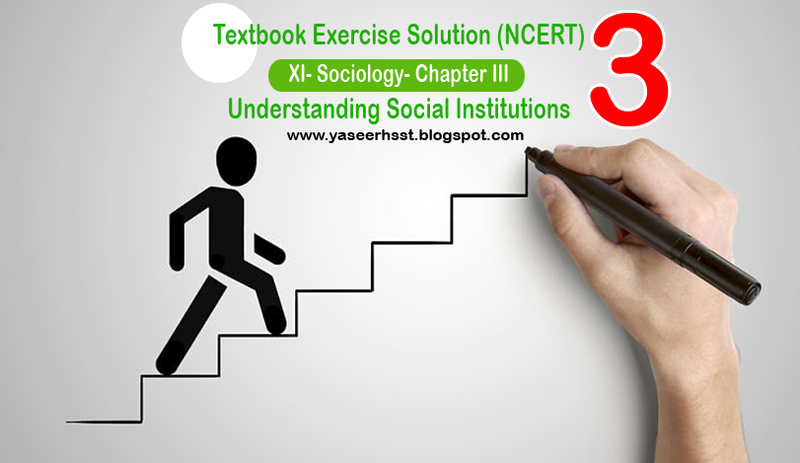 · For functionalists, education system maintains and develops the social structure and culture. For those who perceive society as unequally differentiated, education functions as one of the main stratifying agent. · According to common sense knowledge of a lay man, schools provide with one of the basic components of socialisation. As a child grows and learns to become a part of the group amongst his/her peers, this process of inculcating the values and norms of the society starts. Thus, the individual becomes a part of the society.